Toro recently introduced the all-new Outcross™ 9060, a revolutionary, turf-friendly machine that delivers on the benefits of both a tractor and a super-duty utility vehicle. Designed to allow superintendents to do more with less stress, less labor, fewer resources and less time, the multi-purpose Outcross 9060 is a versatile, powerful and productive addition to any operation. The Outcross 9060 is turf-friendly, thanks to a weight-balanced chassis and four-wheel steering, coupled with full-time four-wheel drive. 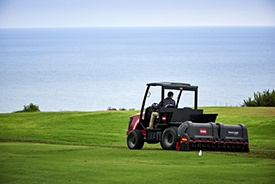 All four wheels turn individually at a rate determined by the machine’s ground speed and turning angle, ultimately minimizing the possibility of turf damage and allowing the machine to traverse various terrain with ease. For more information on the Outcross 9060, watch the video, visit the website or contact your local Toro distributor.